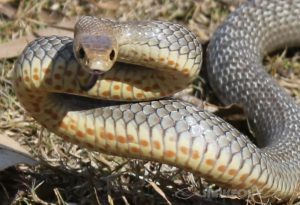 Eastern Brown Snake in defensive display. Note that a full display is even higher up and with mouth open to expose the pink mouth lining, giving you every chance to leave it well alone. The Eastern Brown Snake is often thought of as one of the scariest creatures in Australia, land of the scary creatures. Since childhood we’ve all heard tales about people being chased by these animals, obviously bent on our destruction. However, what many of those “chased” probably never realised was that the snake didn’t, in fact, chase them. After one brief lunge, enough to make the frightened mammal run helter skelter through the bush, the reptile in question most likely slithered off to somewhere more secluded and free of tall bumbling apes. Fortunately most of us can read this communication, and swiftly bugger off. Unfortunately, many of us also read this as a direct attack, an assault not only on our lives but on our supposed sovereignty over the land and all who dwell upon it. Which is why so many Australians assume that these animals have chased them, continuing this so called attack in the way that seems most logical to us. After all, if we were as venomous as these snakes, would we not chase down and kill things far too large for us to eat, wasting precious venom, just for the fun of it? It seems the Brown Snake would not. Below you can see just how long an Eastern Brown will hold this posture for, without striking, in the hopes that the ape pointing the camera at them will simply go away. Do note that this animal was cold at the time, and less reluctant to make even the slightest of advances on our camera man. As unlikely as a bite from one of these animals often is, it does occasionally happen. To minimise risk we always recommend that people do not wander the bush without covered shoes and long pants, and if planning a trek to brush up on your snake bite first-aid. But rest assured that deaths from snake bites happen roughly 2 times a year. To put this in perspective, swimming pools caused 44 deaths in 2017. Horses, roughly 6. Brown Snakes are far from the most dangerous thing around.